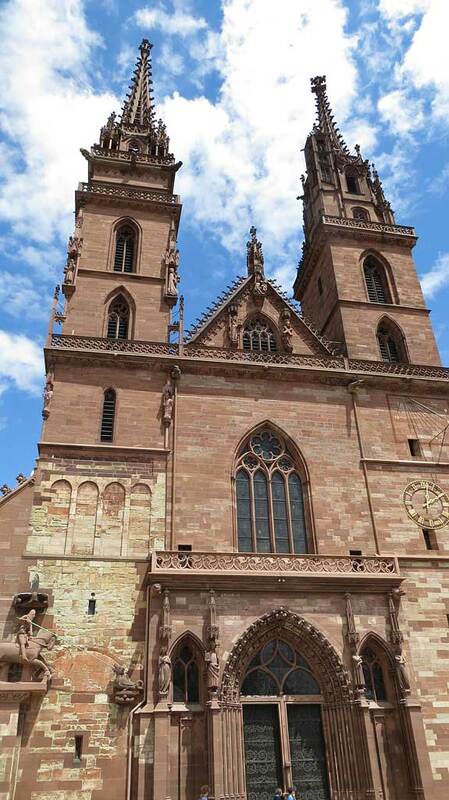 Basel Minster (Baseler Munster) – located in the Old Town along the Rhine River, the Basel Minster church was originally a Catholic church and is now Protestant. Construction was started around 1000. The two church towers are called Georgsturm and Martinsturm after two saints. The courtyards surrounding the church are particularly interesting. 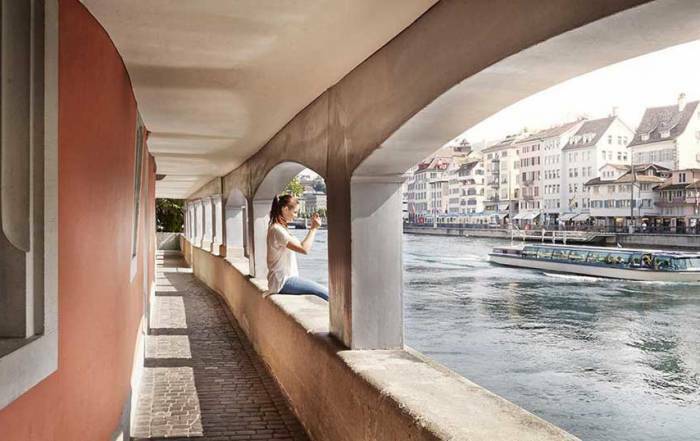 The Middle Bridge (Mittlere Brucke) – the oldest bridge in Basel, located adjacent to the Old Town. See the trams traverse it frequently. Town Hall – view the exterior mural paintings in the open air atrium. The Town Hall faces the Market Square (Marktplatz). St Martin’s Church and the State Archives with over 1,000 years of history. 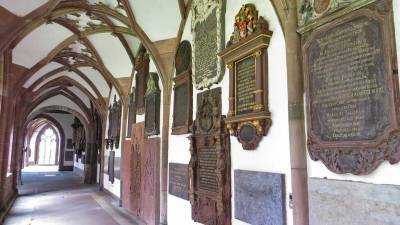 They are located side by side on Martinskirchplatz in the Old Town. Shop and wander through the pedestrian only streets of the Old Town, such as Freie Street (Freie Strasse). Museum of Cultures – Swiss museum of ethnography with exhibits for Europe, the South Pacific, America, Tibet and Bali. Ride the Klingental Ferry (Fähre) “Vogel Gryff” to cross the Rhine River from Old Town to Kaserne. Enjoy restaurants, free theater and concerts. 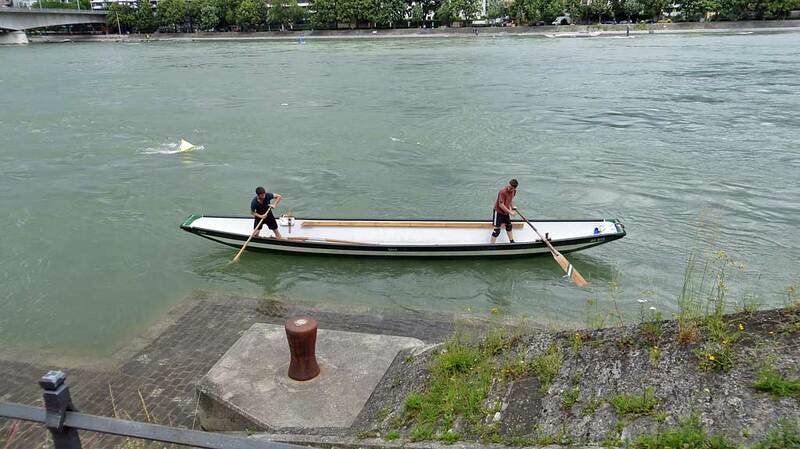 There are several options like this to cross the Rhine on inexpensive reactive ferries that use a steel cable suspended over the river instead of using the power of an engine. 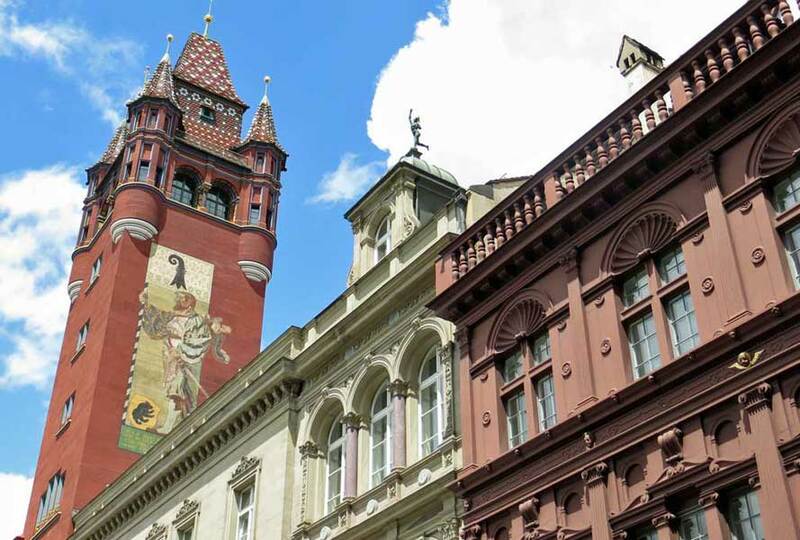 Basel Historical Museum and the Stadtcasino Concert Hall on Barfussen Square. 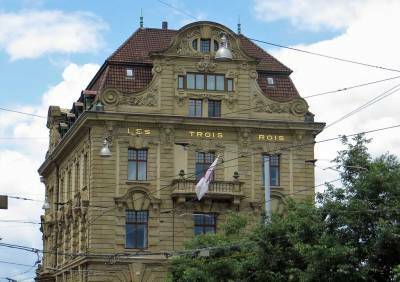 Grand Hotel les Trois Roiss – luxury hotel in the Old Town area. East-West Riverside Hotel – less expensive accommodation with river views to the Old Town. Switzerland can very expensive, so consider staying less than an hour away in Mulhouse, France or Freiburg, Germany. The EuroAirport Basel-Mulhouse-Freiburg serves three cities in three countries. 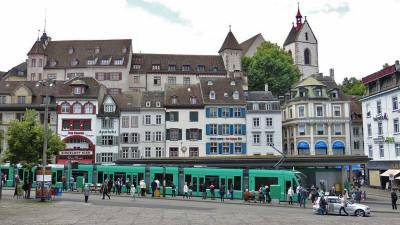 The airport is located entirely in France even though it is only a 15 minute cab ride from Old Town Basel. Take Bus 11 to the St Louis rail station and then take the commuter train to Basel SBB rail station. 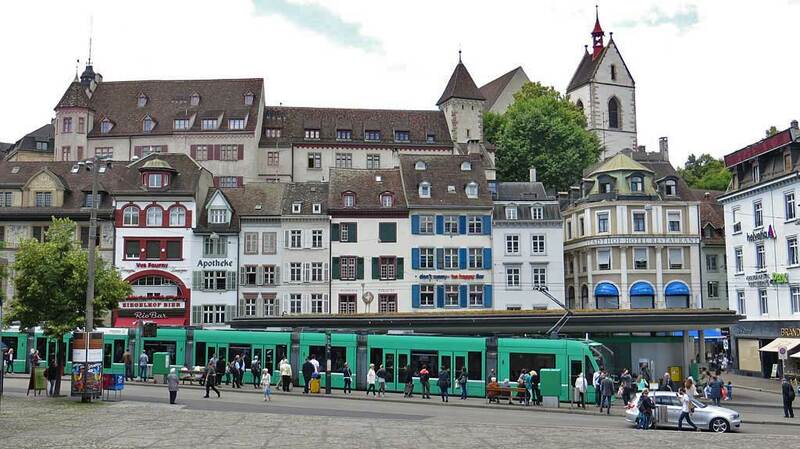 Or take bus #50 directly to Basel SBB. 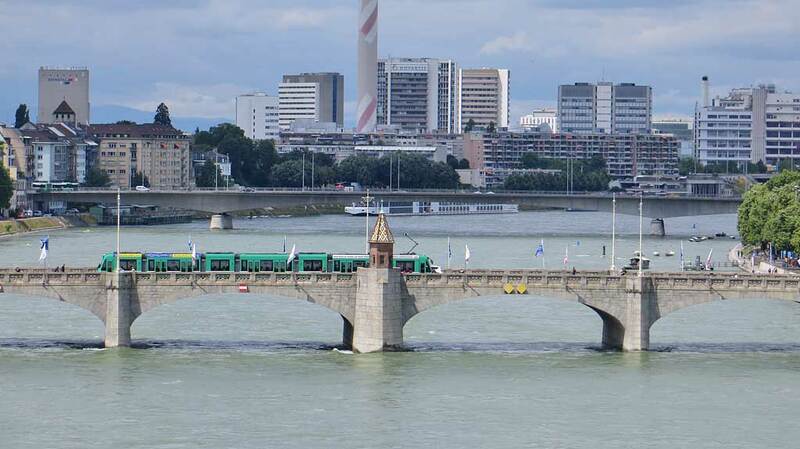 Due to its location at the junction of three countries, Basel has a unique set up for rail transport. There are two major train stations in the city. The Basel Badischer Bahnhof (Basel Bad) station is operated by the German train line, even though its located in Switzerland. The Basel SBB station is used by Swiss and French trains. 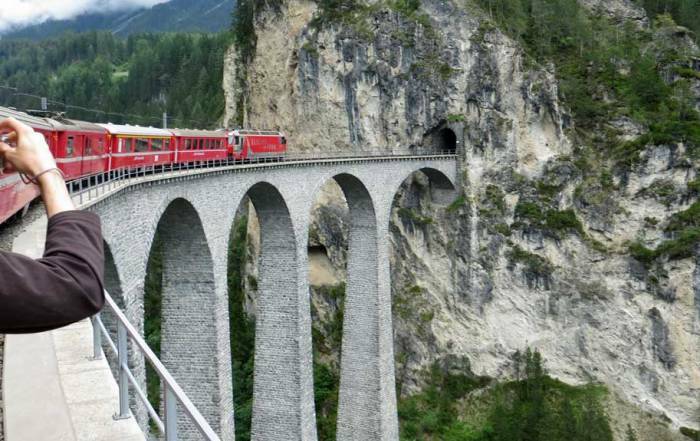 A Swiss Rail Pass includes the right to transfer by rail between the two stations at no charge. Trains run frequently between the two stations and its about a 10 minute ride by rail transport. 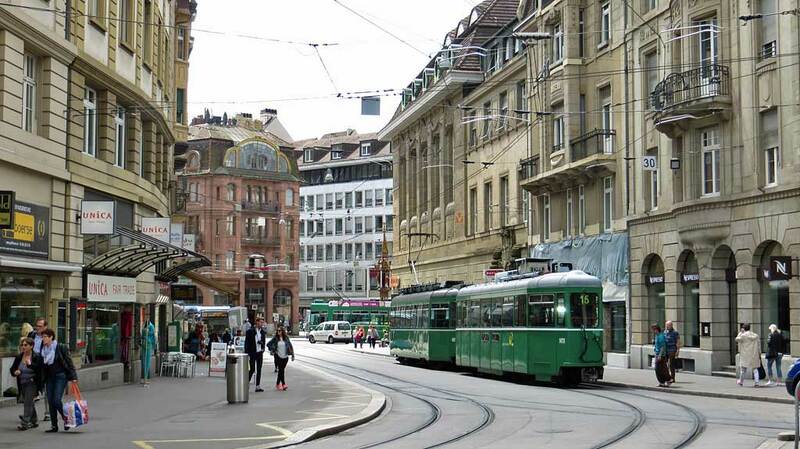 Basel Trams are the life line of the city. Be careful, as they have right of way over pedestrians in the crowded Old Town. Tram drivers do not accept cash or credit. Buy fares from machines at the tram stops. Many hotels offer free bus passes. 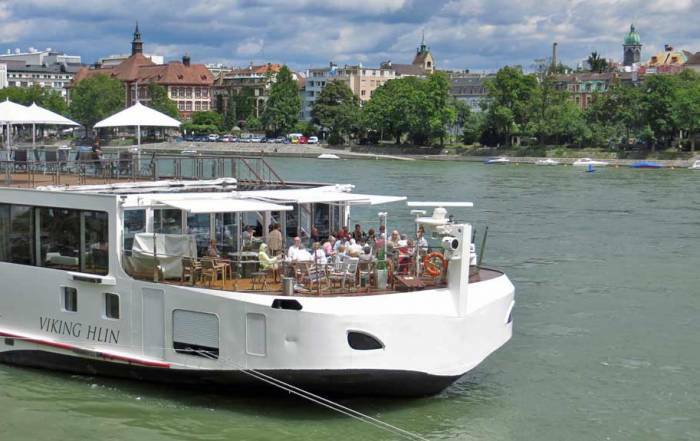 Basel is the upper end of the river cruising circuit on the Rhine River. 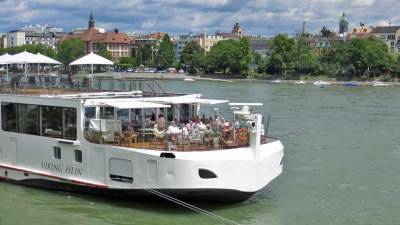 Basel Rhine River cruises can make it all the way to Amsterdam. 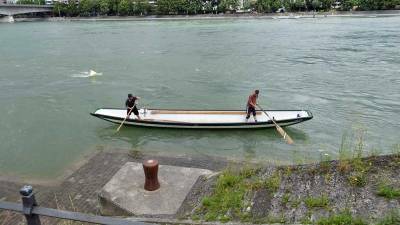 Augusta Raurica is located about 15 minutes up the Rhine River from Basel. This tourist destination is a Roman ruin that includes a museum and an amphitheater with live performances. Basel weather is influenced by the lower elevation of the Rhine Valley. The city is an hour away from the colder weather in the Alps. July and August are the height of summer weather. Expect average highs of 77 F (25 C) and average lows of 58 F (14 C). During the winter months from December – January expect average highs of 41 F (5 C) and average lows just below freezing. Precipitation levels are slightly higher in the summer. Snow is possible from November to March. 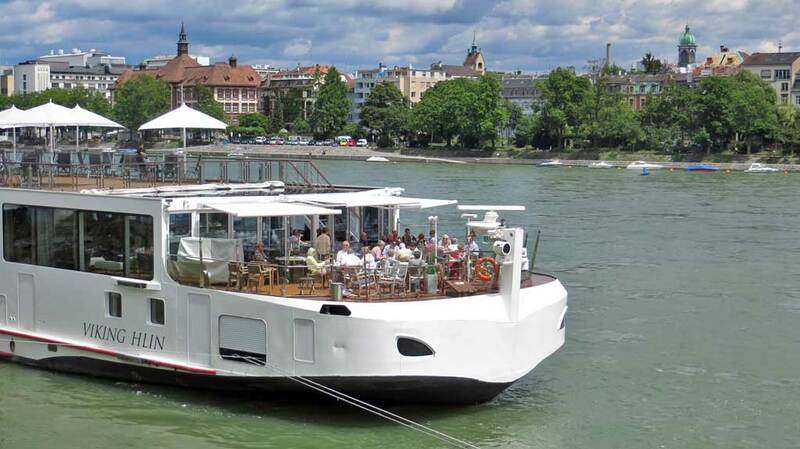 Basel is on the Rhine River. 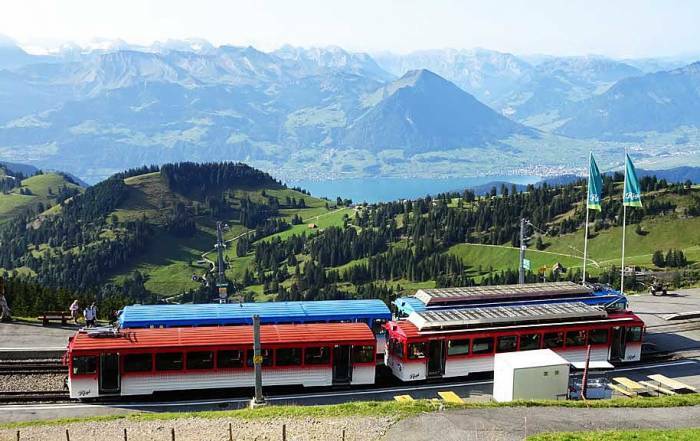 The city is mainly located in Switzerland, but its suburbs extend into Germany and France. 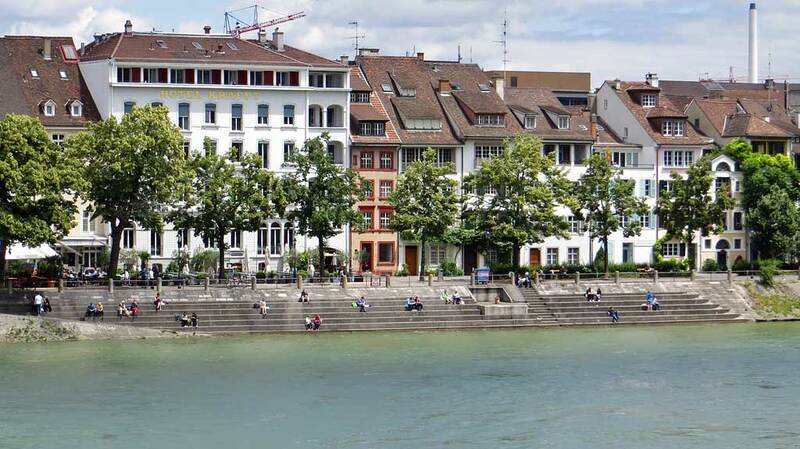 About a million people live in Basel. 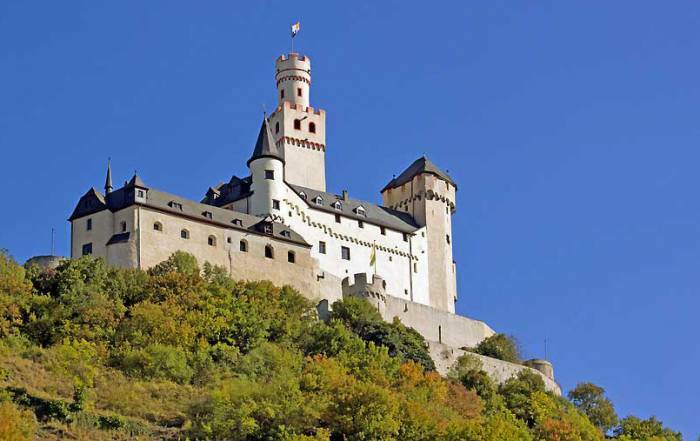 The main languages spoken are two variations of German. Basel is well known for its museums and theaters. The Old Town is located on the west side of the Rhine in what is referred to as Grossbasel (Greater Basel). 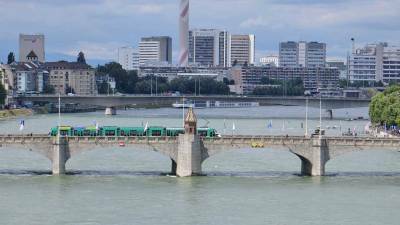 Across the river is Kleinbasel (Lesser Basel).